If you have never been ziplining before, what better place is there to do it than in Oahu, Hawaii? At CLIMB Works Keana Farms, we provide the best zipline experience for everyone, whether it’s your first time or you’ve been multiple times before. 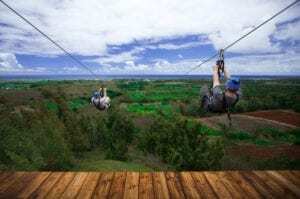 To help answer any questions you might have if you’ve never been, we’ve put together a guide of what to expect when you go ziplining in Oahu for the first time. Our zipline course has 8 side-by-side zipline runs for you to enjoy, which means you can enjoy the adventure with the person of your choice right beside you. Our ziplines are long, high, and extra quiet to enhance your experience. You can see the North Shore’s famous beaches, farms, and lush mountains with your friend or family member by your side. Our lines range from 500 feet to nearly half a mile long! Our zipline tour includes more than just ziplines. Your journey begins with an ATV adventure. 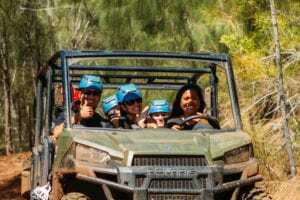 You will ride in an ATV for 2 miles to the top of the mountain. The ride lasts about 10 minutes. You will go by farms, through the jungle, and up the mountainside, allowing you to see all the different inland landscapes that Hawaii has to offer. When you go ziplining in Oahu with us, we give you the opportunity to explore a working farm! Keana Farms produces more than a million pounds of produce each year. Our tour allows you to explore and learn more about the farm as you soar above it. You will see papaya, apple bananas, taro, eggplant, cherry tomatoes and many more. We even let you taste some of the apple bananas or cherry tomatoes during the tour! Of course when you go ziplining you can expect to see gorgeous views. Our zipline tour offers panoramic North Shore views. You will start about 410 feet above sea level, with constant views overlooking the North Shore’s famous beaches, lush mountains and picture-perfect farms. You will love being able to see everything from a bird’s eye view. Another thing you can expect when you zipline with CLIMB Works Keana Farms is safety. We have years of experience building and operating courses around the country, so we can truly offer an experience that is unmatched in quality and safety. Our trained staff takes care of you from start to finish, including all safety operations. Each of our trained guides has undergone thorough and extensive safety training, so you know you will be in good hands. We also use the best in zipline braking, the ZIPKEA, which eliminates riders from having to hand-brake. Not only will you get to learn about Keana Farms, but you will get to learn about Hawaii! Our tour includes educational exhibits along the way that teach you about Hawaii history, culture, and farming. You will have the opportunity to see how Hawaii has changed throughout the years, starting from Historic Hawaii, to the Plantation Era, to today. Now that you know what to expect when you go ziplining in Oahu for the first time, it’s time to plan your adventure! Learn more about our zipline adventure, then book your trip.